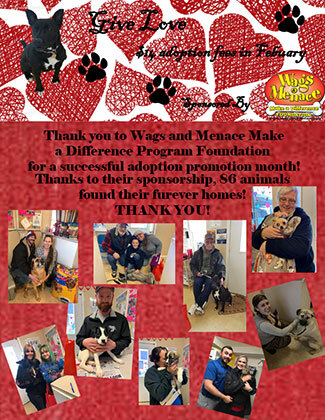 Today we wanted to take time to say THANK YOU to the Wags and Menace Make a Difference Foundation for another very successful adoption sponsorship month! For the entire month of February, 86 animals went to their forever homes!! Thank you for making families complete and sponsoring such a successful month! Enjoy a few of these moments in the photos below.